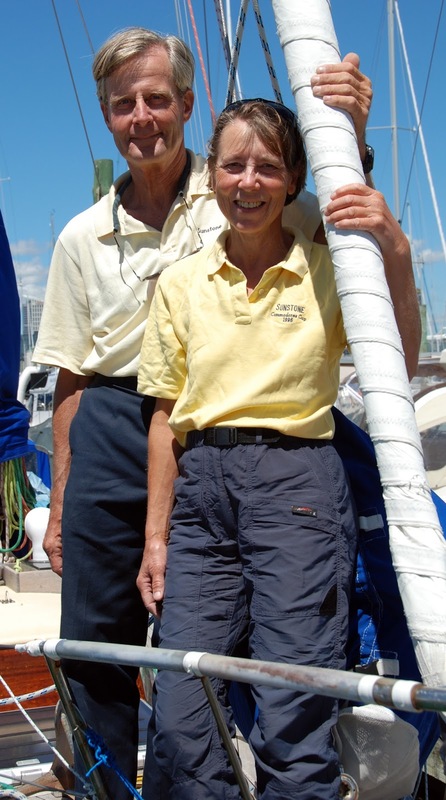 Tom and Vicky Jackson cruised from 1997 until 2015 aboard Sunstone a 1965 McGruer built, S&S designed one-off - timber-built with a varnished hull - hailing from Nelson, New Zealand. They describe their route as "too complicated to describe generally". It goes: UK, Spain, Canaries, Caribbean, New England, Nova Scotia, ICW, Bahamas, Panama, Galapagos, French Poly, Cooks, Niue, Tonga, Fiji, NZ, Aus, New Cal, Vanuatu, Aus, NZ, French Poly, Hawaii, Alaska, Canada, USA, Mexico, Costa Rica, Ecuador, Easter Is, Chile, Falklands, Argentina, Brazil, Argentina, S. Africa, Aus, NZ, Vanuatu, New Cal, NZ, Fiji, Wallis, Tuvalu, Kosrae, Pohnpei, Guam, Japan, Aleutians, Canada, Hawaii, Samoa, NZ, Marshall Is, Aleutians, Alaska, Canada, Hawaii, Tonga, NZ. Also lots of offshore racing among the cruising, including the Bermuda Race, Sydney-Hobart, Swiftsure, Round North Island and Round New Zealand. They say: "We did lots (about 50,000 miles) of cruising as well as offshore racing in NW Europe before we actually stopped work and left to go long-term cruising, which was in 1997. 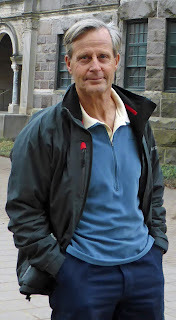 Our last long cruise ended in 2015 and we are now shore-based, but we intend to continue cruising in the South Pacific." You can learn more about their cruise on their website or by email. Having cruised both the Atlantic and the Pacific, how do they compare? We don't really feel this question has a useful answer at least not in terms of significant differences or contrasts. 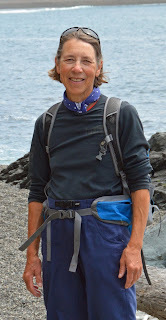 For us a more useful comparison is between temperate and tropical or semi-tropical cruising - or perhaps between wilderness cruising and cruising in more inhabited areas. Certainly the contrast between the latter two is sharp. 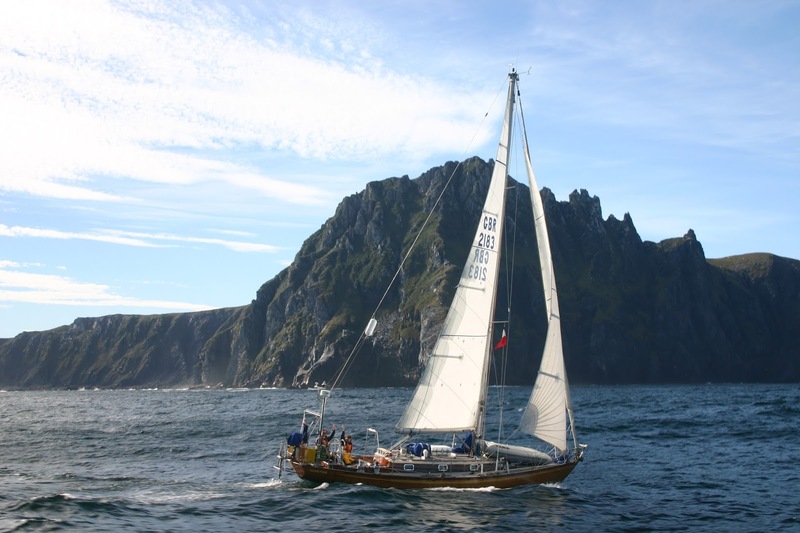 Wilderness cruising, whether in the Aleutians, Patagonia or the Line Islands is demanding in terms of preparation, navigation, sailing/anchoring skills and, most of all, self-reliance. In temperate zones there is also the volatility of the weather. These are in contrast to cruising in more inhabited areas, where the availability of service and support is much greater and thus the demands on cruisers generally less. What is something you think potential cruisers are afraid about that they shouldn't fear? Pirates. Pirates are the muggers of the sea. They can kill you or rob you just like muggers, but there are far fewer of them and they only operate in fairly well known areas. Avoid those areas and it is very unlikely you will ever see a pirate. You are far more likely to be mugged, injured or robbed ashore somewhere. And what is something potential cruisers don't worry about that perhaps they should? Having poor quality sails and not knowing how to use them! Cruisers should race. Racing teaches you not only how to make your boat go quickly in a variety of conditions, it also teaches you about boat handling under sail in conditions you might actually avoid if cruising, namely light and heavy air and tight situations with other boats. These are also necessary skills for a cruiser. Too many cruisers spend a lot of money on devices to make living aboard more like living on land - and then they skimp on sails, buying second-hand or poor quality sails. In fact, many cruisers have little understanding of what constitutes a good, well-made sail which will stand up to tens of thousands of miles of use and still have a shape which will adequately drive the boat to windward when that is essential. Many potential and novice cruising couples do not adequately consider what demands will be made and changes will occur in their relationship to each other. Before heading off on a cruise few couples have spent 24 hours a day, every day with each other in a constantly changing and potentially risk-filled environment. In shore-based life most of us can spread our anxieties, frustrations and tantrums across a range of colleagues and friends as well as our partner. That is not the case when crossing oceans in a small boat. Achieving a complementary balance and trust in your relationship is essential and at first it may be hard work. Many apparently stable long-term relationships founder and sink under the demands of the cruising life. However, many others thrive and grow on the development of new skills, the stronger need for trust and the shared sense of achievement in the face of novelty, risk and difficulties. This depends so much on the nature of the passage that there can be no single answer. When down-wind passage-making in trade wind conditions we normally use the mainsail held with a preventer and a 125% genoa held to windward by an over-length spinnaker pole. In stable, broad reaching conditions, we often also set our inner jib (non-overlapping, but bigger and further forward than a cutter staysail) to leeward on its Solent stay. However, when the wind is forward of the beam and over 15 knots (true, not apparent) we mostly use our inner jib with any reefs which might be necessary in the main. As we do a lot of cruising in temperate waters, we use the latter configuration a good deal. As we always stand our watches on deck, fully dressed for the weather, we are able to reef early when conditions require it. 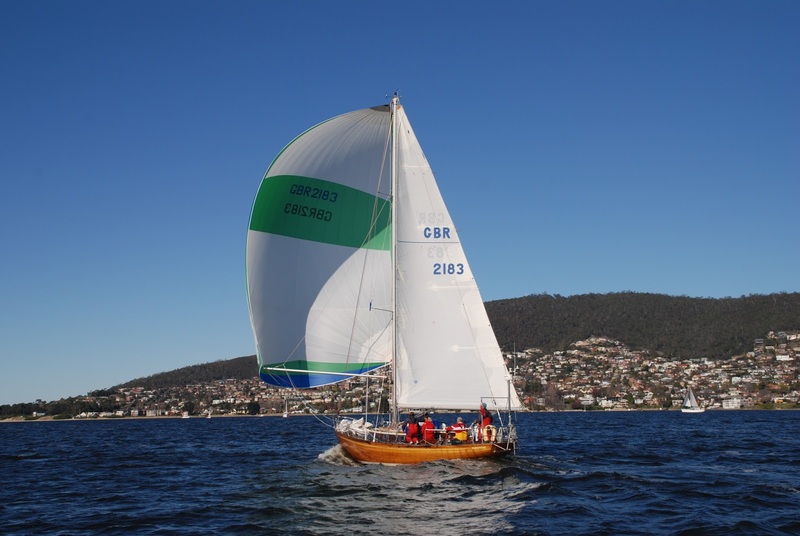 We generally reef or change head-sail single-handed unless conditions are very bad. 'Sunstone' is set up to make this easy. We very rarely use our genoa part-rolled, but rather change to our jib if conditions require it. We are not really aware of any one 'cruising culture'. There are many different styles of and attitudes to cruising and the different styles diverge markedly. What we look for in other cruisers whom we like and respect are curiosity, openness, friendliness, honesty and, most of all, a desire, determination and ability to be self-reliant. Though we don't condemn them for it, we are puzzled by cruisers who actually don't much like sailing and have little interest in improving their ability to sail. These tend to be the same cruisers for whom cruising is just another form of travel. They reach New Zealand, park the boat and buy a car, rather than actually cruising the country. 'Sunstone' was our home for over 30 years, so picking out one thing we particularly like about her is almost impossible. High on the list is that she takes care of us. Some boats require constant, expert attention to perform well or even keep you safe. 'Sunstone' responds to such attention, but does not require it. In conditions when we are cold, wet, tired, hungry and even a little frightened, 'Sunstone' reassures and takes care of us. This is partly the nature of her design, whose compromises have made her just about perfect for the different kinds of sailing which we have done. These include serious racing and long-term cruising as well as living aboard, while working full time at 'suit jobs' in a temperate climate. 'Sunstone' is a very sound, strongly built yacht with a sea-kindly motion, even in storm conditions. Unfortunately, one of the compromises which makes 'Sunstone's' design so good for living aboard, her accommodation arrangement below, requires an offset companion way; this makes it impossible to mount an effective dodger which would give protection in the cockpit. Cruising on 'Sunstone' requires several very good sets of foul-weather gear as well as a tolerance for being wet and cold! No gear on 'Sunstone' breaks often!! In the last 20 years we have cruised about 150,000 miles. During that time we have only had to wait in port once for repairs (engine gear box). There are three fundamental keys to avoiding breakages: buy the best you can afford; keep it simple; maintain it. Listening to other cruisers the items which most commonly keep them in port are: gen sets, autopilots, installed refrigeration and water-makers. 'Sunstone' has none of these. The closest we come is a small camper fridge which we can do without quite happily if we have to. Otherwise, the fundamentals of engine, rig and sails can be the cause of problems. All three can be kept going by regular inspection and maintenance. Our small Yanmar engine has done 10,000 hours in 19 years without a rebuild, despite being used as our primary power generator. How often do most cruisers go aloft to inspect their rigs or replace rigging wire? In the tropics, rigging wire should probably be replaced every seven or eight years. Rigs need inspection after any heavy blow, before any long passage and then after it. Sails need regular inspection and 'a stitch in time saving nine' or more likely 100! If a piece of gear seems prone to breakage or failure, there may well be something wrong with the way it is used or its suitability for purpose. If a piece of gear is inevitably subject to constant abuse, like the heads pump, carry a spare which is always ready as a replacement. How to catch fish and how to stay warm sailing in the Bering Sea. Having our faith in the fundamental goodness of human nature reinforced! After living afloat for 35 years, we suppose that we expected to be asked (as we often are), how different it is to live ashore or how we've adapted to the change. We guess that the most fundamental answer to the latter question is that if you weren't adaptable before living afloat and cruising, that life is likely to make you adaptable. Moving ashore and buying our first house to live in after 41 years of marriage has just been another adventure - and we still feel at home when aboard 'Sunstone'. The other bigger question is what made us start it all in the first place. Why would we choose to live first on a 31' boat and then 'Sunstone' while pursuing responsible jobs. At first the answer was easy. We couldn't afford both a boat and a house. We had to have a boat, so we didn't have a house. But there was more to it than that, because we did actually have our own version of a pre-nup: we both agreed that the only basis on which we would get married was if we lived on a boat. From the very first we agreed that if we really wanted something, we would pay the price. We wanted to go sailing as much as possible. If the price was living in cramped, damp, cold quarters with no appliances, TV, stereo, running water or shower, we would pay the price. We even decided to live that way ashore for the few years while we saved enough for our first boat. We learned to live without 'stuff'. Paying the price has got us the life we wanted. And in the circular way that all things so often work out, what we got, namely 'Sunstone', has shaped not only our sailing lives, but the whole nature of our lives together. 'Sunstone' has taught us a lot and helped us to learn about each other.